Are you taking part in the 2016 ARC-USA or ARC-Europe? 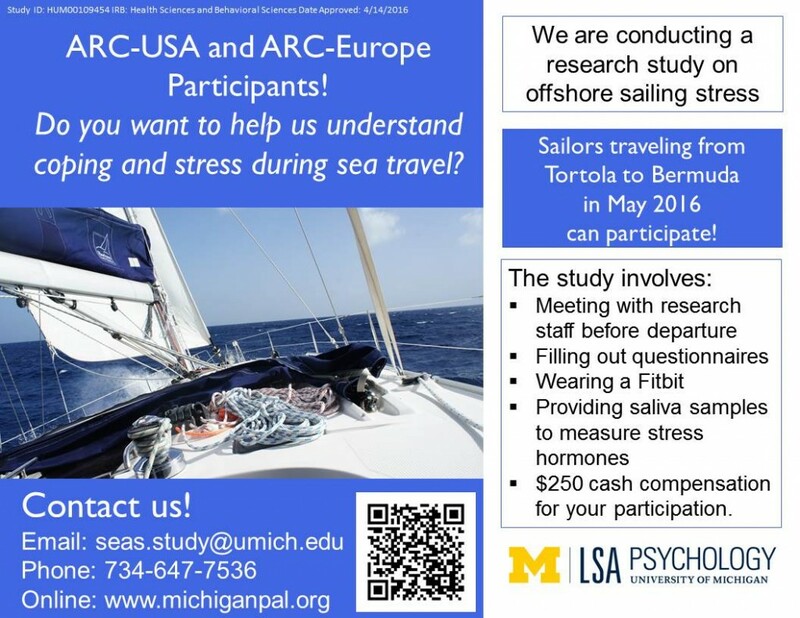 Join a research study on offshore passage stress and help advance the science of stress and passage making! The Sea Stress Study is an initiative by a group of stress researchers at the University of Michigan led by MPAL Director Dr. Nestor Lopez-Duran that aims to study the impact of stress in naturalistic settings. Stress is linked to a variety of negative health outcomes, including hypertension, compromised immune functioning, and greater risk for mental health problems. Yet, some individuals cope with stress in ways that prevent these negative consequences, and some individuals even thrive in response to stressful conditions. Unfortunately, we do not fully understand what mechanisms are responsible for adaptive vs. maladaptive stress regulation. Stress research is challenging in that scientists are often limited to either study stress in artificial settings (laboratories) or study stress after it happens (natural disasters). Our Sea Stress Study aims to provide an alternative way to study individuals before, during, and after stress exposure. Since ocean sailing involves different types of unpredictable stress, studying ocean sailors undertaking long ocean passages provides an ideal setting for the study of stress in a natural environment. Specifically, the Sea Stress Study looks at how ocean passages impact mood, sleep, hormones, and various cognitive processes such as memory and attention. The first step in this initiative is to conduct a feasibility study to examine the practicality of collecting different types of data before, during, and after ocean passages. To this end, we will soon be recruiting 3-5 boats traveling from Tortola, BVI to Bermuda in May 2016. Complete brief questionnaires before, during, and after the passage. Provide saliva samples during the passage to measure stress hormones. Wear a small activity monitor (Fitbit) throughout the passage. option to keep the Fitbit ($150 value). If you would like additional information please contact us at seas.study@umich.edu.